NTFS for Mac OS X is a software that allows to detect a NTFS storage device with a Mac OS. Thank to that, it is possible to modify, erase all stored data in this volume. With high performance of the Mac system, NTFS for Mac OS X offers the same transfer rate as the native format of Mac OS. The user can then extract any stored data in his NTFS drive and copy it to another emplacement. Apart from these features, NTFS for Mac OS X gives also the possibility to adjust some settings like the security option. The latter prevents any recovering of the data after deleting them. With this software, the user is able to perform all standard tasks such as formatting the disc, copying and editing documents. Indeed, the NTFS partition will be automatically mounted and manipulated like native Mac partitions. The driver can handle compression of NTFS files. 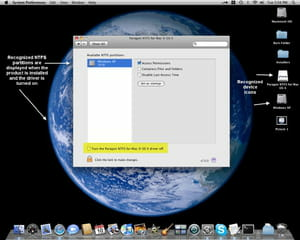 NTFS for Mac OS X allows a stable exchange of data between Windows and Mac. This is a multilingual software including Chinese, Korean, Russian and other more. NTFS for Mac OS X does not support Microsoft dynamic volumes. Power PC G4 and G5 are not supported. Latest update on October 9, 2017 at 04:23 AM.